My ten year old son has been asking for a mask made by Huck DelSignore for a long time now. Like most kids, he has a great imagination. Unlike many grown-ups who have altogether lost or tend not to use them, kids use their imaginations to problem solve, to cope and to dream. Their imaginations are still very much attached, useful appendages to their psyche, not unlike a compass guiding an inner voice. It makes me wonder why as adults we ever lose touch with it. Huck DelSignore is one grown up who could enlighten me on this subject as she is still very much in-touch with her imagination, a perfect example of how our imaginations and inner voices need not be restricted to childhood alone. It’s hard not to love her creations for all their weird and beautiful ways. It’s no wonder my son is drawn to their playful, beguiling forms. Huck has a gift for creating ethereal, other-worldly creatures that, on the surface, are big-eyed and magically anthropomorphic but beyond the googly eyes and beneath rainbows of fur and crocheted fluff is the stuff of magical dæmons, replete with the surprising and most welcomed ability to conjure dormant imagery from the recesses of our minds. My mind always finds its way to His Dark Materials, the unforgettable fantasy trilogy by Philip Pullman. In her Airstream studio in Housatonic, MA, Huck and I shared a cup of tea and talked about her childhood. Huck has always been an adventurer, probably a result of Nurture as much as Nature. Crohn’s Disease interrupted her teenage years and made staying in school and going to college impossible. Undeterred by the restraints of a conventional education and numerous operations to her intestines, Huck made a path of her own, ironically, by following her gut. Huck is now a mother of three girls, and one more, a little boy, is on the way. Over the years following her high school surgeries, she has learned to manage her Crohn's Disease and balance it alongside Pregnancy and Motherhood. Healing for Huck required a lot of physical and emotional growth. Post-surgery stretches extended beyond her body, past the tense scars - the emotional kinds, too. In time, she learned much more about self-care. She learned to mimic the diet of early eaters, because her digestive abilities were like a baby's; to eat the right things for her, like winter squash, rice, chicken, apple sauce and yogurt; to eat frequently; to listen to the early signs of discomfort as signals to detour around flare-ups; and to employ deep relaxation techniques instead of responding in fear that she was going to become terribly sick again and that nobody would be able to help her until it was full-blown. Another key element to Huck’s healing is that she discovered something new, something that would keep her away from the gastroenterologist for years: Medicinal Marijuana. For Huck, it has been a profoundly effective choice in her journey to wellness and a method she readily prefers over “truly fu*#~d up pharmaceuticals”. Huck's path to wellness began along her youthful journey across America. Hitch-hiking from one Alternative scene to the next, Huck was living in the moment, observing and learning all the way. 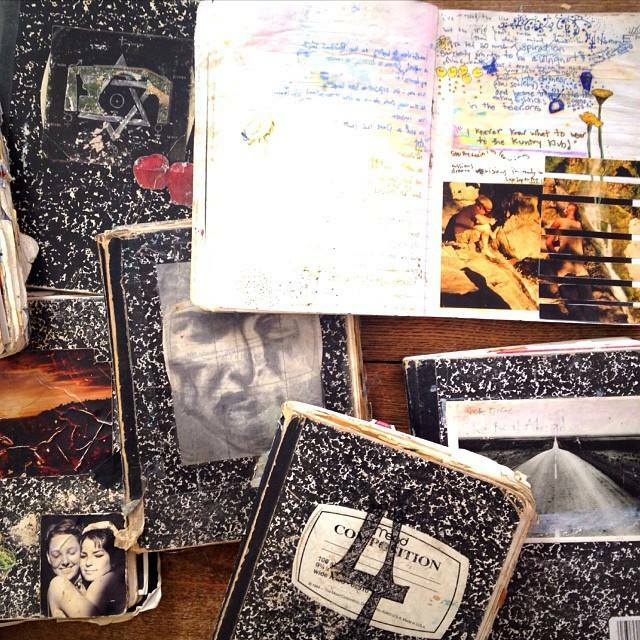 Just one look at her worn and frayed travel journals and it’s enough to know that her imagination and inner voice were thriving right alongside her, neither buried nor covered up with “should do’s” and convention. "These are from back when I was hucking it across the country. This open book is from 1998 when my friend Megan and I were hitchhiking up Highway 1..."
Huck did not fall upon the linear line that money and a certain set of social expectations often pave. She didn’t drink from the cup of Mainstream America and she never once sipped the proverbial corporate Kool-Aid, and for that, she remains authentic. It’s as though her imagination was never severed or, at the very least, was permitted room to roam and grow. There was never a chance that it might be lobbed off in the name of Corporate Productivity and Profit. For Huck, there was no corporate challenge to her inner dæmon. She never expected herself to conform and therefore remained a free spirit. It comes as no surprise then that she is able to create magnificent ‘appendages’ for others. In so doing, she inadvertently manages to help them discover long lost dæmons buried deep inside. But being a "therapist" isn't at all why Huck crochets. Some sort of catharsis just happens naturally when people come in contact with her art and it isn't at all contrived. Now, that’s Interactive Art. When a Brooklyn photographer visited her studio with a few collaborators, they were overcome by her masks and propelled toward a moment of pure release, freedom, and let their imaginations run wild, beautiful and untethered, like the vines and overgrowth that filled the ruin where they played. As one of Huck’s masks joins to a psyche, it liberates it from a world of “should do’s” and other conventions that keep us striving to be in the same box with others where we can feel “safe.” It’s nothing new, but the truth about human nature is that while we may crave “the box” that is Conformity and feeling a part of the mainstream, we are never truly safe, nor satisfied in any one box. Huck’s masks are deliberately playful, temporary expressions. They are the anti-thesis of the myriad invisible masks we wear throughout a life time - the ones we put on [and keep on] for our parents, for our teachers, for our siblings, friends, bosses and colleagues, lovers and spouses. Our invisible masks are at once both simple and complex, outward-inward methods of behavior, people-pleasing or displeasing measures that don't always reveal Authenticity. Huck’s masks reveal who we are when captured in a fleeting, spirited, pure moment, something that is as natural as child’s play but is not so fluid and natural for adults, whose years of wearing countless invisible masks has worn down the playful strokes turning them to self-conscious smudges. Masks aren't at all bad. They serve a purpose. Stemming from insecurity just as much as good manners, masks inform us and protect us, from ourselves and from others. “Don’t say that in front of him,” “you better not act like that when she is around,” “Go easy on him…” or conversely, when the mask comes off “enough already, say what you want you to say,” “this is who I am. Like me or don’t like me”... and so on. Why as grownups are we surprised then when conflict erupts or does not erupt when we expect it to as we reveal ourselves? which mask will you wear today? If you put the wrong mask on one day, take it off, or don’t bother to wear one at all…who cares? During the course of a life time we all outgrow our masks as we discover that they no longer work and serve no purpose. While this process is as truthful, honest and liberating as it gets, ridding ourselves of masks, like shedding skin, is often uncomfortable, itchy and painful as both an ending and a beginning take shape. Dropping one mask for another is at the very least, a truth-revealing pursuit, where, at long last, we un-do some patterns we've built up that no longer serve a Good purpose. In shedding unwanted layers and unraveling outdated patterns of behavior, we shift our brains, our perspectives and our hearts... and while we’re at it, we are gifted more room to breathe, and what could be healthier and more joyful than having more room to breathe and to breathe deeply? As we trade Convention for Liberation, we get closer to a deeper understanding of ourselves so that when we do find ourselves in that proverbial box, stuck and unable to breathe – [and we will find ourselves there, because we are human] – we are capable of extracting ourselves. Struggling to breathe, want of fresh air, high anxiety are all part of being “boxed in” and they are present in our lives for any number of reasons…because we are not truly being ourselves; or we are not yet aware of our true selves; or we are not being seen as we truly are. Ohlala, it’s all so beautifully Existential…but ohlala’s aside, if we don’t allow others to see our true selves, and allow others to look at us for who we are - beautifully broken and perfectly cracked - then it follows that we are not being truthful with ourselves…and sometimes that gets pretty twisted and boring…a clear signal that it’s time for change...and a new mask, the kind Huck makes. We are all blissfully unaware of some of the masks we wear yet painfully aware of others. How many masks do you wear? For whom do you wear them, and why? Next time you come in contact with someone, anyone, anywhere – at home, at work, in a grocery store, hiking in a forest, making love, or just passing on the street – play this game and ask yourself: “Am I wearing a mask right now?” Have some fun answering these questions and then call Huck and have a new mask made, one that’s all your own. You might just love the outward expression of your inner dæmon and the freedom it brings. Sometimes, you just have to lose yourself to be yourself. Go on, Good Girl, Be You! Huck’s masks have been featured in British Vogue and can be found at Mass MOCA. To learn more about Huck visit her website Huck and Stuff.